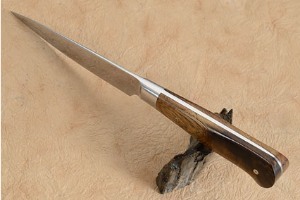 The blade was hand forged in a technique known as san mai (three layers). Layers of stainless steel surround a 52100 carbon steel core. The result is the exceptional edge holding of carbon steel with significantly easier care. 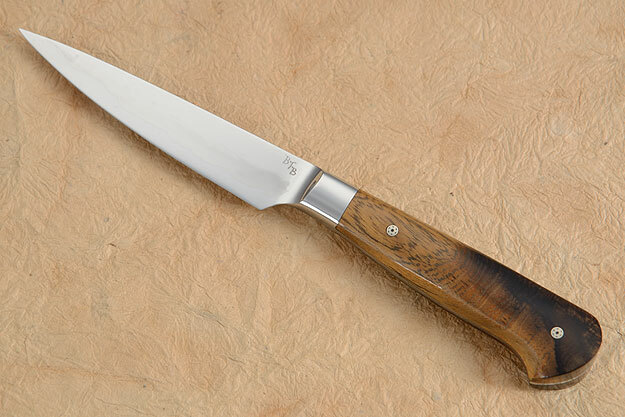 Like his hunting knives, this paring knife was pre-tested for edge flex and cutting ability before assembly. The heat treatment followed the formulas developed by Mastersmith Ed Fowler and Bill Burke and creates some of the sharpest and most long lasting edges found anywhere. 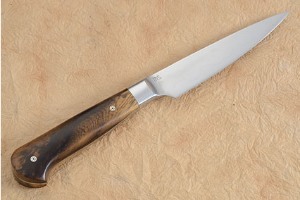 The stainless bolster was tig welded to the blade for strength and durability. 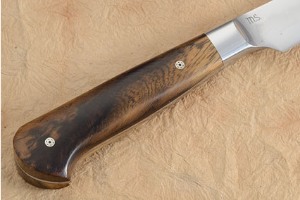 The handle is formed from desert ironwood -- one of the hardest woods found anywhere and is set with decorative mosaic pins. 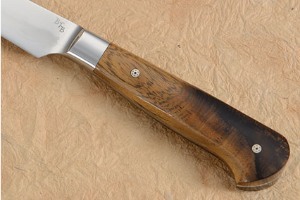 It is nicely carved to swell at the front of the handle, move into a slimmer waist and finally to swell again at the beak at the end of the handle. The knife has perfect balance and feels exceptional in the hand.